COMPANY PROFILE Occidental Petroleum Corp is in the business of exploration and production of oil and gas. It also processes, gathers, transports, stores, purchases and markets oil, condensate, natural gas liquids, natural gas. Occidental is an independent exploration and production company with operations in the United States, Latin America, and the Middle East. At the end of 2017, the company reported net proven reserves of 2.6 billion barrels of oil equivalent. Net production averaged 601 thousand barrels of oil equivalent per day in 2017, at a ratio of 25% oil and NGLs and 25% natural gas. 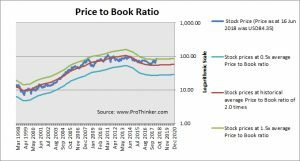 At the price of USD84.35 as at 16 Jun 2018, Occidental Petroleum Corp is trading at a Price to Book Ratio of 3.1 times current book value. 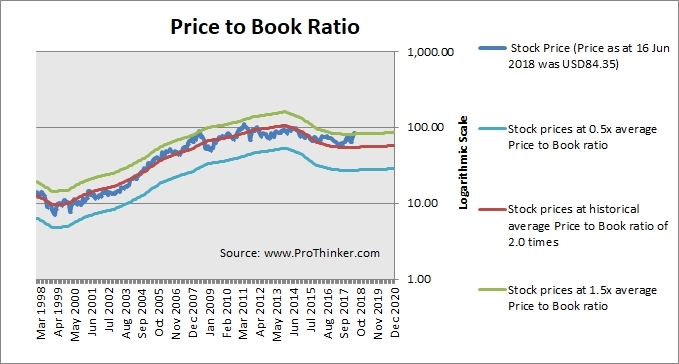 This is a 55% premium to its historical average Price to Book Ratio of 2.0 times.